Have you ever wanted to polish or apply a new layer of protection, but you were stopped by the old layers of protection on the surface? 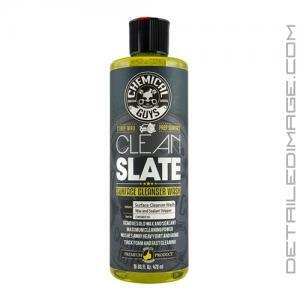 If so, the Chemical Guys Clean Slate Surface Cleaner Wash is the product you are looking for! Add one ounce of Clean Slate to your 5 gallon wash bucket and easily wash away all of the dirt and grime from your vehicle. You may not see as much foam with this shampoo, but it is packed with incredibly slick lubricants that encapsulate and lift dirt from the surface, which helps you safely and easily remove contaminants from your paint without adding any imperfections. Once you are finished you will not only have an incredibly clean surface you will have safely removed all of the old layers of wax and sealant that have built up over time. This gives you a "Clean Slate" to work with! You can now polish away imperfections, apply a wax, apply a coating or install a clear bra to this clean surface, which only improves your results. Clean Slate is pH neutral, non-caustic, and it will not dry out any rubber, plastic, or vinyl trim pieces. If you are looking for a shampoo that can not only clean the surface, but remove old layers of protection as well, the Chemical Guys Clean Slate Surface Cleaner Wash is for you! CLEAN SLATE SURFACE CLEANER WASH is a premium shampoo specifically formulated to wash and strip away layers of waxes or sealants off the surface of your vehicle. The advanced cleaning formula releases dirt, grime, waxes, sealants, oils and any type of protective coating away from the surface. Clean Slate is super concentrated for maximum cleaning power that rinses cleanly off of the surface. The innovative surface cleansing shampoo washes away old layers of wax and sealant to prepare the surface for a new layer of protection. Use Clean Slate after polishing to remove the unwanted oils before waxing. The intensive cleaning wash solution prepares the surface by removing heavy dirt, grime, road filth and contamination from any exterior surface. Clean Slate provides maximum lubrication for washing any surfaces. Clean and prepare the surface of your vehicle for a fresh layer of wax or sealant. Start your detail process the right way with Chemical Guys Clean Slate. Wash the surface of the vehicle from top to bottom. I use this product to prep for ceramic coatings to make sure i've cleaned off all the old residue. Works great. I used to use dish soap before I started a full detail. I saw this stuff and figured I'd give it a shot. Boy! I'm glad I did! Dish soap doesn't come close to the stripping power this stuff has. There was always beading left behind after dish soap. Not with this stuff...I never thought it would make as big of a difference as it does. Wish all wash soap held suds this long. I would recommend using more than the suggested 1 oz. per 5 gallons to really get all the wax and/or sealant off.